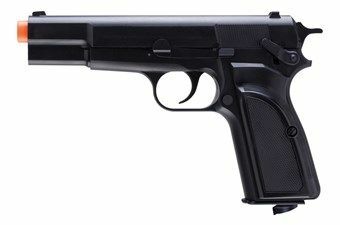 Buy Cheap Browning Airguns 2279070 Hi Power CO2 Airsoft Pistol |ReplicaAirguns.ca | Easter Weekend Sale! Trigger Pull: The trigger pull on the Umarex Browning Hi-power Mark III is not too bad but has more resistance when the airsoft magazine is full as the first part of the trigger pull is dedicated to advancing a BB into the BB chamber, this is true in both single and double action. Shooting the Browning Hi-power in single action mode is a bit smoother but also has some resistance right at the beginning. Overall I would say it has a medium pull and as you can see in my shooting results the trigger did not affect the accuracy negatively at all! Accuracy: Excellent for an airsoft shooter I shot a 1 inch 7 shot group from 20 feet out in a semi-rested position and this is was with open sights! I also shot freehand in double action, shooting quickly and also got a very respectable 2.5 inch pattern that represented an additional 36 shots. When it came to FPS performance the Umarex Browning Hi-power Mark III was a bit lower than claimed which is not unusual with most airguns (369 fps averaged 8 shots). The Umarex Browning Hi-power did get well over 100 shots per CO2 but I would have given up a few shots for a bit more power. Build Quality: I would have liked to have seen this air pistol replica use a lot more metal and perhaps some more working parts. As is it is mostly plastic and very light weight but the fit and finish are good overall and the gun should work just fine and hold up over time. Realism: The Umarex Browning Hi-power Mark III is a licensed replica of the actual Browning Hi-power Mark III semi auto pistol. It is a very close "looking" copy in almost every way. I like the fact that there are no side screw holes that you find in many plastic moulded BB pistols and the Browning Mark III has a working ambidextrous safety and magazine release just like the real Browning Hi-power Mark III. The let down here is in the .92 pound weight of the Browning Airsoft version, it just doesn't have that "gun like" weight to it which makes it feel a bit cheap. I would have really liked to see this Airsoft pistol in all metal and with a working slide, and I would not have minded to pay extra for the upgrade in materials. None of those side assembly screw holes which are a dead giveaway that it's an airgun. Feels well-built even though it is a bit light weight. Inexpensive but has good fit and finish. Trigger and hammer are metal. Excellent accuracy and decent power. Full size magazine that is very easy to load. Very good replica of the actual Browning Hi-power Mark III. Mostly plastic which makes the gun feel kind of light weight. Could have just a bit more power even at the expense of less shots per CO2. No white dots on the sights? 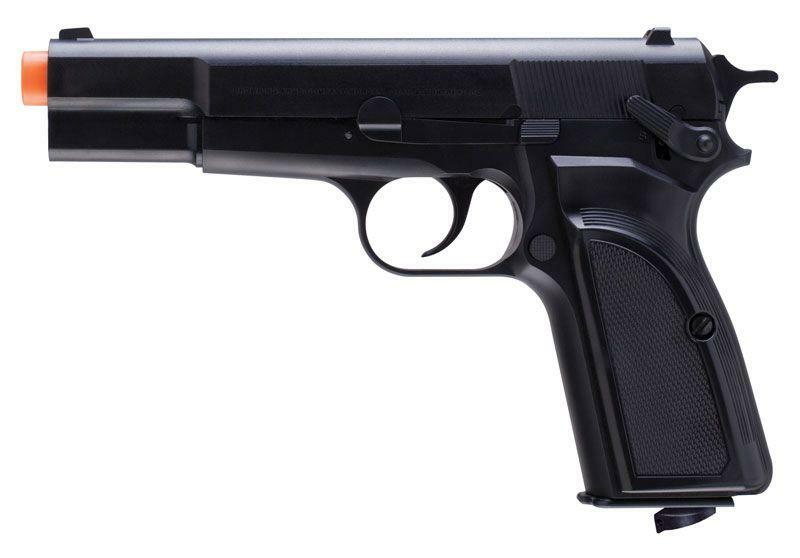 Comments: The Umarex Browning Hi-power Mark III Airsoft pistol is a very good replica of the real steel version of this gun and in terms of "looks" alone does a good job making this pistol very believable. Now once you pick it up, you know it's not the real deal because of the plastic build and much lower weight. So with that out of the way, let's talk a bit more about what I did really like about the Browning Hi-power Mark III! I liked the excellent accuracy, easy to load and use full size drop out metal magazine not often found in a low price airgun like this, and I also like the fact that there are no screw holes on the side of this gun found in so many plastic and even some metal BB guns. So overall the Browning Hi-power Mark III is a good overall replica, has excellent accuracy and is really the only Browning Hi-power available in an airgun that I know about. This is my favorite non blowback airsoft pistol I've ever owned.Pros- feels amazing in your hand, amazing accuracy, able to pull the hammer back to shorten the trigger pull by about 80% making an even more accurate shot.M1911 lovers just haven't held a hi-power before.Cons- plastic build, nob on the bottom of the mag to tighten co2, kind of dislike the sight of something protruding out of the bottom of the mag. http://www.ReplicaAirguns.com - Browning Hi-power Mark III CO2 BB Pistol Table Top & Shooting Review. This is a table top and shooting review combined of the Umarex Browning Hi-power Mark III CO2 BB Pistol. I show you around the gun and walk you through its basic operation and handling. I also test the Umarex Browning Hi-power Mark III out with my Chrony Chronograph to see what the real world fps velocity actually is and I also shoot it from 20 feet out on a target to see how accurate this BB pistol is. The Umarex Umarex Browning Hi-power Mark III is mostly plastic but in terms of looks and functionality has a lot going for it with its single and double action trigger, full size drop out magazine and browning licencing and trademarks throughout. http://www.ReplicaAirguns.com - Umarex Browning Hi-power Mark III CO2 BB Pistol Preview. I received another airgun from Umarex USA, this time it was the Browning Hi-Power Mark III in a 4.5mm CO2 BB Pistol. (Thanks for sending it Umarex!) I did have to cross the boarder and bring it back which always adds to the excitement because you never know what to expect and how educated the CBSA guard will be? It did go pretty smoothly this instance so I had some time to make this short Preview video for you. I cover some of the basic specifications and give a short walk around of the Umarex Browning Hi-Power.